Give Your Loved One a New Smile This Year! The holidays are here, and we know that means people all over Toronto are drafting holiday gifting lists. However, this year, instead of the traditional holiday presents, why not give your loved one something they’ll truly cherish for a lifetime: a gorgeous new smile through convenient orthodontic treatment. If you’re a parent with a teenager getting ready to perfect their smile, there’s no gift quite like Invisalign Teen. Your smile is your best asset – and for a growing teenager, it’s something they’ll rely on for a lifetime. Adolescent orthodontic treatment is critical for achieving a healthy smile for most patients, and the image of a teenager with braces is so common, it’s almost become a rite of passage. Braces are an excellent option for orthodontic treatment, but if you want to gift your child something special with their treatment, Invisalign Teen can’t be beat. Based on the revolutionary Invisalign System, Invisalign Teen makes invisible, removable orthodontic treatment fit into teenagers’ lifestyle. Just like the original Invisalign, Invisalign Teen comes with numerous advantages over traditional braces. 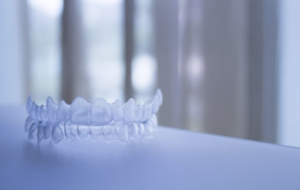 The aligners are almost invisible when worn, so patients don’t have to worry about having braces for prom or school pictures. Because the aligners are removed to eat, drink, brush, and floss, teens can still enjoy their favorite foods and easily maintain oral hygiene. But in addition to these primary benefits, Invisalign Teen comes with features custom-tailored for teenagers. Every Invisalign Teen aligner has a built-in Blue Dot Wear Indicator, which signals parents and orthodontists if the aligners are being worn enough. This tells doctors, parents, and teens themselves if treatment is going well or they need to be a bit more diligent. Invisalign Teen can also be made with unique “eruption tabs” that hold space open for unerupted teeth, allowing us to treat patients whose teeth haven’t fully grown in. Finally, every Invisalign Teen treatment course comes with six free replacement aligners – so if any get lost or broken, there’s nothing to worry about. This year, give your child something special: the gift of a gorgeous new smile without the need to worry about having braces for prom, school pictures, or other milestones. Contact us today to schedule your consultation appointment. We’ll help you understand the treatment process, create a detailed plan, and help your child achieve a gorgeous new smile through convenient, custom-tailored treatment! 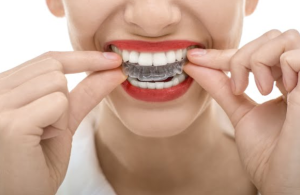 If you just got your first set of Invisalign at our Toronto orthodontic office, you might be a little excited or nervous about living with Invisalign. Wearing your Invisalign will be a slight adjustment to what you’re accustomed to, but we have a few tips for our Toronto Invisalign patients to make living with Invisalign even easier than ever. Here are our top tips for wearing Invisalign in Toronto. Invisalign is clear and nearly impossible to see, but the people you are close to might notice something different about you while you’re wearing Invisalign, at least at the beginning of treatment. Even though Invisalign is clear thin and hardly noticeable, you may have a slight lisp when you first start wearing them. Your friends and family may notice the lisp but don’t worry, after a while you will get used to talking with Invisalign, and your lisp will disappear. One of the main reasons our Toronto orthodontic office loves Invisalign so much is because of how effective they are. Typically we see shorter treatment times for patients who are wearing Invisalign when compared to traditional braces. There is one caveat to this though; it only is quicker if you wear them for 22 hours or more a day. This means all day every day unless you’re eating or brushing your teeth, which you should be doing after you eat too. If you don’t wear your Invisalign aligners for at least 22 hours a day your treatment time will drastically lengthen. This tip is one of the harder parts about wearing Invisalign. Every time you eat or drink anything other than water you need to brush your teeth if you’re wearing Invisalign. If you don’t brush your teeth, bacteria can build up more easily between your aligner and your teeth causing plaque to develop more quickly. Because of this, we highly suggest buying a lot of travel sized toothbrushes and keeping them everywhere. Keep them in your purse, your pocket, your desk at work, the car, your friend’s house, their friend’s house, anywhere that you might be eating you should have at least one travel toothbrush. This is a benefit for some people and a disadvantage for others. When we see our Toronto Invisalign patients come in for a new set of aligners one of the more common things we hear is “I’ve lost weight because of Invisalign!” Now this doesn’t happen to everyone, but we do see some people lose a few pounds because they would rather leave their aligners in than have a snack in the middle of the day. One of the more common mistakes we see with our newer Toronto Invisalign wearers is drinking liquids that can easily stain your teeth and Invisalign aligners. Drinks like red wine, coffee, and tea are highly acidic and can discolor your teeth and your aligners. If you ever want to enjoy a glass of wine or your morning cup of joe, just make sure to remove your Invisalign aligners before taking a sip. Just like your teeth, your Invisalign aligners will have bacteria grow on them over time. Unlike your teeth, you shouldn’t use toothpaste on your Invisalign aligners. Toothpaste is slightly abrasive, which means if used on an Invisalign aligner, it can make micro-scratches on the surface which will eventually turn yellow. We suggest using either denture cleaning tablets or Invisalign’s cleaning crystals at least once a week to clean your Invisalign aligners. Now that you’re an expert in how to get the most out of Invisalign, contact City Orthodontics today! We’re Toronto’s Invisalign experts and are here to get you started on your treatment plan or simply answer any questions you may have about Invisalign or our other orthodontic treatments. We hope to hear from you soon!